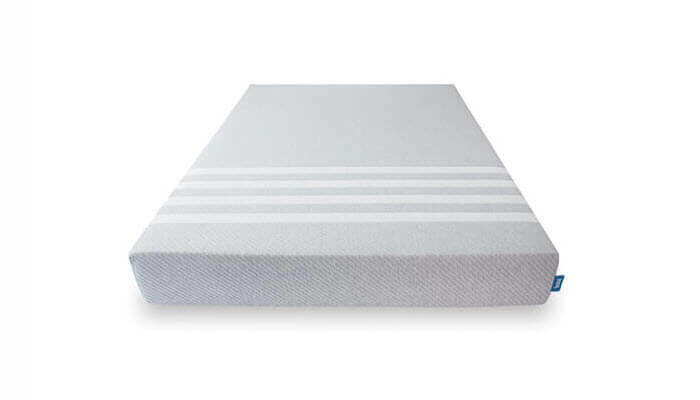 Today we will be taking an in-depth look at some of the most popular newcomers to the foam mattress industry. If you were to be in the market for a foam mattress over a decade ago, you wouldn’t have been able to afford one unless you had a large budget. Foam mattresses used to be a luxury that was only available to the wealthy. This trend has transformed rapidly in the past few years – there are now tons of new foam mattress producers that are making foam mattresses accessible by people with much lower budgets. And this doesn’t mean that you’re having to sacrifice quality either. 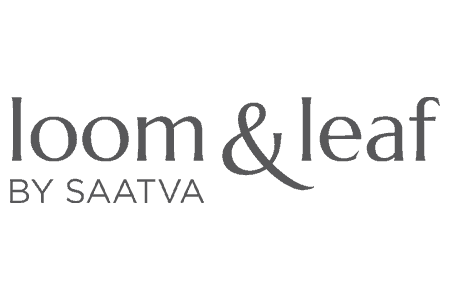 Manufacturers like Loom & Leaf and Leesa have been able to provide high-end, quality mattresses within a much more accessible budget. This review is aiming to provide you with all the details you need to determine which of these two mattresses is most suitable to you. Keep in mind, depending on your preferences and body-type, neither of these mattresses might be what you’re looking for. That’s why it’s important to look at some of the other reviews on our website before you make any decisions. We compare many of the top-name brands so that you don’t have to. It’s hard to talk about the new mattress manufacturers disrupting the industry without talking about Leesa. This company has only been in the industry for a couple of years, but they’ve certainly made their mark. They’ve grown very popular for making some of the most comfortable and affordable mattresses on the market. All their mattresses are made in the USA. You also receive free shipping and a 10-year warranty with every purchase. Any returns in the first 100-days of ownership will be granted a full refund. 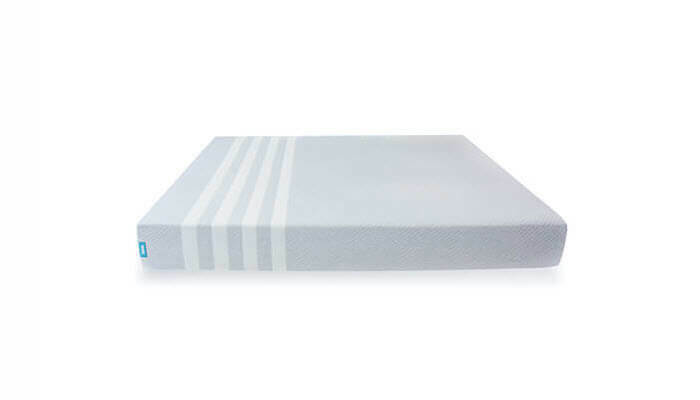 The Leesa mattress is constructed using fairly basic techniques – it is a three-layer mattress that ensures there are no wasted components inside of the product. Each of these layers services a different purpose – this will be discussed in more detail below. This is a layer that uses Avena foam, which is a high-end foam product used exclusively by Leesa. It provides comfort without sacrificing breathability – a rare trait in today’s world of foam mattresses. This portion the mattress is 2” thick. This layer is also 2” thick, but it is made using memory foam. Memory foam tends to be one of the most prominent foam types available in the foam mattress industry. The only downside is that it is notorious for retaining way too much heat – using it as a secondary layer has allowed Leesa’s mattresses to avoid this all too common downfall. This is the support layer of the mattress, this is the most vital component in terms of the structure of the mattress. Without this, you would simply sink to the bottom of the foam. The Leesa cover is very rudimentary – it is made from a single piece of material which is composed entirely of a polyester-lycra blend. This may seem basic, but it provides the breathability that the mattress needs to stay as cool as possible. You will understand what we’re talking about if you try it out. People think that not having an intense mattress cover is cheap, when it’s actually the practical and right thing to do if you want to avoid too much heat. The only downside to this cover is that it doesn’t provide any additional edge support. A lot of Leesa’s competitors have invested in having ample edge support so that their mattress doesn’t lose firmness on the sides when you move closer to the edge of the bed. In terms of support, the Leesa is a pretty sturdy bed overall. We’ve tested this mattress extensively and determined that it comes in at a solid 6/10 – in the middle of the pack, but more firm than many of the competitors in the market. If you’re of a normal weight, you’ll find that this mattress is just about perfect for you. It doesn’t give you too much resistance, but also ensures that your body is straight and supported throughout the night – the perfect combination for the perfect sleep. The Avena foam has been highly rated by the users of the mattress, the thickness of the top layers of comfort foams has really allowed for this mattress to become known as one of the most comfortable currently on the market. It has a great degree of responsiveness that is not seen in other mattresses. Many consumers find it annoying that they sink too deep into their mattresses – luckily, this is not the case with a Leesa mattress. The Leesa mattress has been praised for fixing bad sleeping behavior in the past. There are many owners who claim they have begun to be able to sleep in more effective sleeping positions since purchasing the Leesa. Loom & Leaf is one of the other more popular entrants to the mattress industry. It has been able to catapult itself to the top of the foam industry market by producing comfortable and affordable products, and while it is not as cheap as Leesa, it is still a great price point. One of the ways that Loom & Leaf has been able to differentiate itself form the mountains of competitors is the added benefits that they offer their prospective buyers. They offer a 15-year contract instead of the standard 10 that seems to be the normal amount in the industry. In addition, they also offer a 120-day money back guarantee, which is about 20 days longer than the normal refund period. In addition, everything they make is constructed inside the United States. The only downside is that they do charge you for shipping, so you should factor this into the total cost of the mattress as Leesa doesn’t do so. The Loom & Leaf mattress is one of the thickest mattresses on the market – it’s 12” thick in total, which is remarkable for a foam mattress. They construct the mattress using four different layers that each have their own purpose. Each of these layers will be discussed in further detail below. This layer is 2” thick and is constructed from a gel foam that you won’t find in any other mattress. 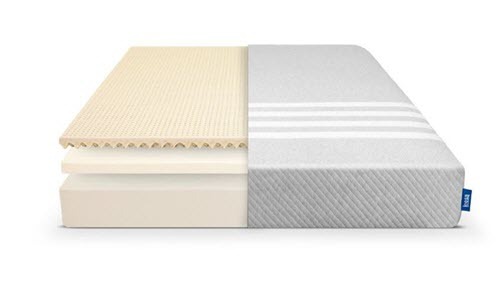 This unique material creates an extremely comfortable top layer that also has the ability to breathe better than many of the other materials used in competitor mattresses. This layer is also used to create extra comfort for those who purchase a Loom & Leaf mattress. It is 2.5” thick and is constructed using visco-elastic memory foam. A material used by Tempurpedic to construct their mattresses. This is constructed from loft pad – it is 2” thick. It provides the perfect transition from the top of the mattress to the bottom layer of the mattress. This layer is 5.5” thick and provides the support for the mattress. This is made from advanced high-density foam – it is much more firm than any of the other materials used in this mattress. One of the unique things about the Loom & Leaf mattress cover is that it is made from organic materials. Loom & Leaf use organic cotton and natural thistle to construct the cover. This means that the cover is actually fire resistant – you may not think about this, but traditional polyester covers are actually quite prone to catching on fire. The only downside to this design is that it tends to be a lot thicker than a lot of other covers. This may sound like a good thing, but sometimes it’s not. This is because the thicker your cover is, the more it will retain heat – this can be a massive pain for those who are trying to find a cover that doesn’t have this kind of problem. If you sleep badly due to heat retention, this might not be a good mattress cover for you. Loom & Leaf have made a very comfortable mattress, it’s part of the reason they have been so successful – in fact, it’s the main reason. Their top layer of gel foam has done great things for many people who find that they don’t like traditional memory foams. In addition, it’s very breathable – although, as previously mentioned, the cover sort of takes away from this. 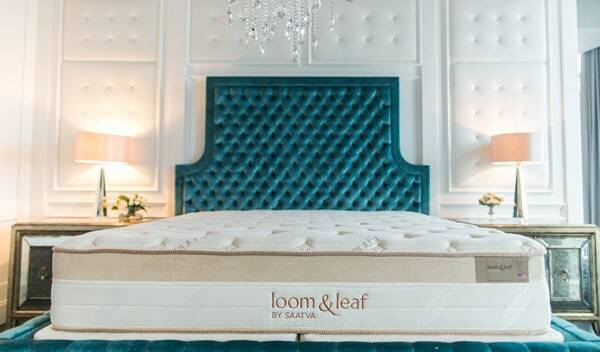 In terms of support, the Loom & Leaf mattress comes in at around a 5.5/10. After extensive testing, we determined that the mattress isn’t quite as firm as the Leesa mattress, but still scores a bit above the pack. 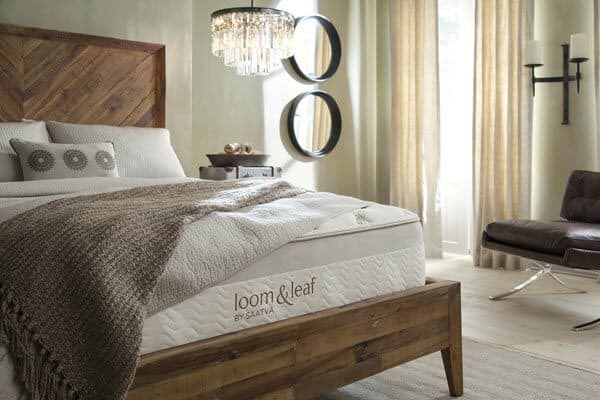 If you’re looking for a mattress with a lot of support, the Loom & Leaf is not for you. You should have a look at some of our other reviews as we do cover a few mattresses that are better suited to heavier sleepers. If you’re a super light sleeper, this is the perfect mattress for you. You won’t feel any pressure coming from the base of the mattress – it is truly a wonderful sleeping experience. With the Loom & Leaf you will still be able to get considerable hug and contour from the mattress, which is one of the primary reasons that foam mattresses are so popular. Trial Period – 120 days. About 20 more days than most other companies offer, but we’re not sure that 20 more days will be the difference in making a decision. Leesa is one of the most affordable mattresses on the market, and while Loom & Leaf is a more expensive brand, it comes with a few advantages. The primary considerations you should contemplate while making a decision should be the preferences that you and your partner have. Consider the levels of support that you’re looking for, as well as which materials that you think you will find more comfortable. Remember, you can return the mattresses without having to pay for anything within a certain period of time, so there really is not much of a risk in terms of cost. If you do value the length of warranty, the Loom & Leaf mattress offers one of the longest warranties on the market – five years more than the Leesa mattress. If you don’t think either of these mattresses is suitable for you or your body type, check out some of the other reviews on this website.